A shortage of EpiPens is causing worry for people with allergies in the UK. The makers of the adrenaline injection pen, which is used to treat severe and life threatening allergic reactions, say the supply problems are due to manufacturing issues. The Department of Health said they were working with the manufacturers to "resolve the supply situation as quickly as possible". They said limited supplies were being closely managed. "Any patient who is unable to obtain supplies should speak to their doctor about using an alternative adrenaline auto-injector device," said a government official. 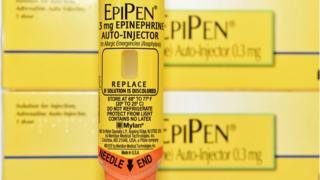 EpiPen is the biggest of the adrenaline auto-injectors on the market and shortages have had a knock-on effect, cutting into the stocks of other AAIs Jext and Emerade. Jacqueline Scoins Cass has 10 allergies, including dairy, latex and coconut, for which she needs to carry EpiPens. It is recommended that people carry two pens as the first one may not work on its own. Jacqueline managed to get one EpiPen in April and was told she would receive a second one soon after. She said the six months' wait had been a "worry" but she knew she was better off than other people she talked to on allergy forums. "It's affecting people across the country," she said. "People have been traipsing pharmacy to pharmacy to try and find them because they didn't even have the first pen - at least I knew I had one pen that was in date. "It would be really worrying if you didn't have any at all - out-of-date adrenaline is better than no adrenaline but obviously these pens have a shelf life for a reason. "I really feel for the people who haven't got one. The charity Anaphylaxis Campaign says anyone anxious about their prescription should visit their GP and talk about it directly with them. And do not dispose of any "expired" AAI devices before receiving a new one. Even if a device is out-of-date, as long as the liquid inside is not cloudy or discoloured it can still be used in an emergency. Jacqueline had to wait a month last year for her second pen and hopes the issues will have been sorted out by the time she needs to replace them next time. She said: "Pens last a year or 18 months. So, if everyone's struggled to get them and they've all come in at a similar sort of time, they are all going to expire at the same time next year again. So, hopefully, they've future-planned that there's enough medication for then." The shortage has affected people in the US, Canada and Australia as well as the UK. Mylan, who market Epipen, said Pfizer was "working hard" to increase production and supply would stabilise towards the end of the year.